Brake Da Fence makes the same 404 engine mistake - they were all on the piss (booze) I reckon. nothing else. ...Reportedly, Northrop Grumman was not comfortable with the terms of the “fixed-price incentive, firm-target contract” that the Navy is offering. Another reason for not bidding could be that the Aerospace Systems business sector of Northrop Grumman is already working at capacity on other Pentagon programs. It has won the B-21 new stealth bomber development contract; is still developing the RQ-4/MQ-4 high-altitude UAV; and is also producing a highly-classified penetrating ISR airframe that is now entering service with the USAF." They want the program rapidly, not the tanker? "...Weiss stressed the importance of the MQ-25 being purpose-built while most tankers are derivatives of other designs, which, he said, generally leaves them compromised. Originally, Lockheed did look at re-purposing its canceled U-class surveillance drone, the Sea Ghost, but Weiss said that the Skunk Works team was unsatisfied. A lot of that ability comes from the AI Lockheed Martin has running the MQ-25. For instance, sensors on the front of the Stingray through which the operator watches a yellow-shirted leading petty officer directing them on a carrier flight deck also has indicators to show the LPO that the operator is watching them. That is to facilitate communication and easier landing and parking on a crowded flight deck being shared by manned and unmanned aircraft. The company won’t reveal any partners working on internal technology or avionics yet, but Weiss said that Lockheed is leveraging its work on open-system architecture to mission control systems to give the Stingray that ability to work smoothly with manned aircraft, some basic ISR capabilities, multi-vehicle control potential and, above all else, the ability to grow and adapt in the future. To that end, stealth capabilities are one arena that Weiss said could become relevant at some point. Though the Stingray is not a low-observable stealth design, the flying-wing form factor and open-architecture system lend themselves to that capability if the Navy expresses interest in the future. A demonstration for the Navy is coming up soon, showing an unrevealed configuration aircraft that Skunk Works is confident “is very representative” of the MQ-25’s capabilities." "WASHINGTON ― General Atomics Aeronautical Systems has successfully demonstrated flight deck taxi capability for the MQ-25. Using a Predator C Avenger as a surrogate, the company demonstrated its unmanned platforms can integrate with the complexities of flight deck operations. The Avenger specifically showed it could taxi and transition to launch and recovery phases. “This demonstration proves that the GA-ASI solution will integrate into existing ship operations, and that translates into less time spent steaming into the wind for launches and recoveries,” David R. Alexander, president of GA-ASI’s aircraft systems unit, said in a news release. Flight deck operators used specially designed wands that enabled the unmanned system to “see“ standard Naval Air Training and Operating Procedures Standardization flight deck director hand gestures using GA-ASI recognition algorithms. “MQ-25 will be able to ‘talk back’ to the controller and other flight deck personnel using a small series of LEDs that change colors and/or flash to show that they have received a command and indicate the aircraft’s condition or operating state,” Alexander said. “To give you an idea of how the system works, think Wii for aircraft control.”..."
"General Atomics Aeronautical Systems demonstrated aircraft carrier deck-handling controls for its MQ-25 tanker bid using a pair of motion-sensing director wands and an Avenger unmanned aerial vehicle as a stand-in for its yet-to-be-built prototype. The demonstration showed the ability to control the Avenger UAV on a tarmac using hand movements, including the ability to direct taxing, and transition to the launch and recovery phases, General Atomics showed in a video posted to its website. The specially designed director wands are the same size, shape and weight as those used on aircraft carrier decks to direct manned aircraft, such as the F/A-18 Super Hornet, the company said. General Atomics’ wands use proprietary gesture recognition algorithms to identify standard hand movements, as designated by Naval Air Training and Operating Procedures, and then translates and sends those commands to the MQ-25 air vehicle, the company said. The aircraft receives the commands and converts them into the appropriate actions. Directors can fully control aircraft taxi operations on deck using the wand, including lowering and raising the launch bar, spreading and folding the wings, and raising the arresting hook, General Atomics said...."
"Weapon bay door" ??? @ 2:35 of the video Spaz posted. It would seem LM & AGI both have an eye towards the boom-boom. The handling of the "air system" as merely a component of the programme betrays one of the most unique features of the USN's acquisition strategy for the MQ-25. For the first time in an aircraft development programme, the navy will assume the role as the lead systems integrator. 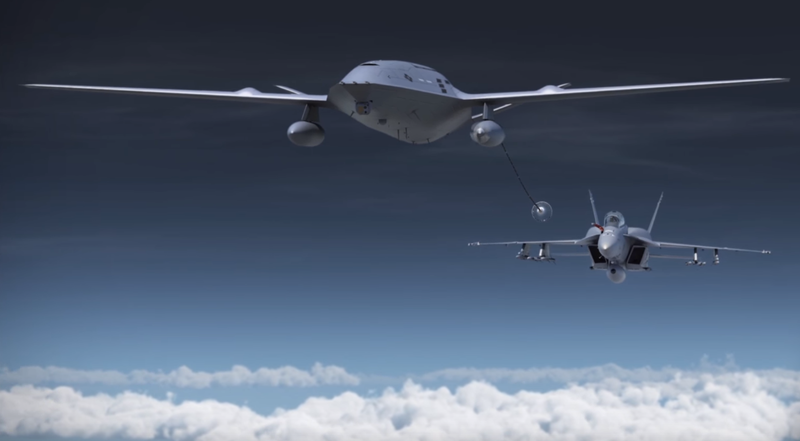 This means that the service – and not the air system contractor – will develop the MQ-25's carrier-based cockpit, which is designated as the MD-5, as part of the control station and connectivity segment. The USN also is responsible for delivering the Carrier Vessel, Nuclear segment, which includes adapting its ships to accommodate the MQ-25 and the MD-5, such as modifying the joint precision approach landing system and the airborne launch and recovery equipment systems. Such an arrangement produces some awkward moments. 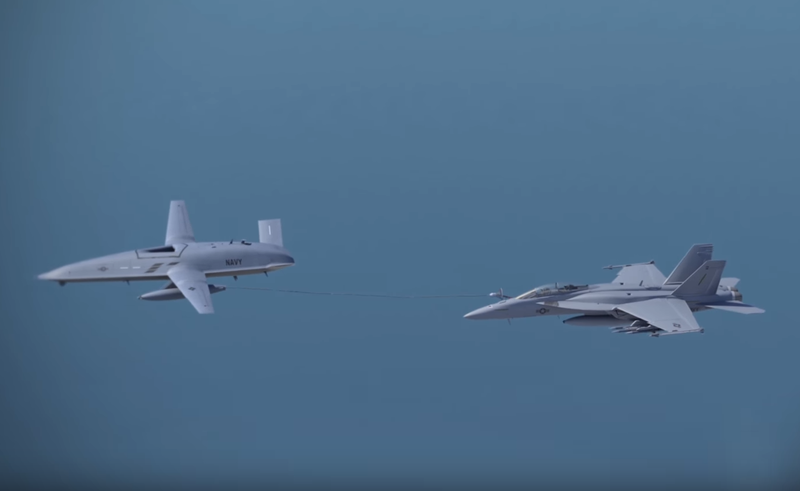 When asked for details about the concept of operations for the aerial refuelling system, the contractors can only shrug and say the lead system integrator has not shared it yet. But it also narrows the contractor's focus on the air system component only. Although details of the in-flight choreography of aerial refuelling are not known, the contractors are responsible for designing a system that manoeuvres the aircraft around the carrier deck, obeying commands from a yellow-shirted deck handler as any manned aircraft would. The UCAS-D activity allowed Northrop to take the first crack at inventing such a system. The X-47B was controlled on deck by an additional crewman who stood beside the yellow-shirted deck-handler. The additional crewman wore a battery-powered controller on his right hand, which was connected by radio frequency data link to the vehicle. As the yellow-shirt commanded a manoeuvre, the crewman used the controller to move the aircraft right, left and forward. Boeing is keeping its approach to deck handling operations a competitive secret, but General Atomics and Lockheed have provided full details. Strikingly, neither company adopts Northrop's pioneering approach on the X-47B, but has adopted two very different approaches. In General Atomics' system, there is no need for adding a dedicated crewmember solely for deck handling. Instead of using a person to interpret the deck handler's commands and relay them to the aircraft, the company has developed a "smart wand". The gestures used by the deck handler are transmitted by the wand to the vehicle, which responds as if a pilot was on board. Lockheed's system requires adding a crewmember simply for deck handling, but offers a certain degree of simplicity. A camera is embedded in the front of the aircraft. The video captures the commands by the deck handler, then transmits the feed in real time to an operator below decks. ...The PW815 also is the power plant for the twin-engine business jets Gulfstream G500 and Gulfstream G600. The G500 is close to completing FAA certification testing and is scheduled to be delivered to a customer later this year after a delay of several months." ...The GA-ASI team built upon its analysis performed under the Navy’s concept refinement contract to develop a scalable mission architecture that supports Open Mission System standards and the Navy Inter-operability Profile datalink. During the flight, the MQ-25A surrogate’s payloads were remotely commanded by GA-ASI’s extensible payload command and control system. The team will leverage this software to enhance the Navy’s Unmanned Carrier Aviation Mission Control System. Between flights, GA-ASI quickly reconfigured the unmanned aerial system with different payloads to demonstrate the system’s modular design and the benefits of an open architecture solution." How about slinging a few AMRAAM's under each wing? Or even better, internally?? I'd feel a lot better about its ability to protect itself. The Navy might even come to use it as a mini arsenal plane, loaded up with AIM-120D's for defense of the carrier strike group. Lots of gas, lots of persistence. Lots of firepower. No pilot fatigue. No pension to pay said pilots, etc. Combine that with a few F-35C's on strip/deck alert, and a few E-2D's and you've brought the cost of 24/7 air defense WAY down, extended F-35C airframe life and shut down aircraft/cruise missile threats 350 miles out. ...Lockheed’s entry for the MQ-25 uses a wide-field-of-view camera positioned on the nose of the aircraft for a panoramic view of the deck. Combined with Lockheed’s software and control mechanisms, this helps the company address one of the Navy’s key concerns. In this case, the operator of the UAV can see directions from personnel on the carrier deck perhaps even better than an F-18 pilot, according to John Clark, vice president of intelligence, surveillance and reconnaissance for Skunk Works. Once the aircraft takes off, the software allows the operator to remain in the loop or allows for more autonomous operations constrained by rules of engagement. “The Navy doesn’t want to add a lot of people on the carrier deck,” Clark said. “We are doing everything with the existing deck infrastructure through a mix of software and automated controls. We can complete this activity fully with the personnel on the deck.”..."